Linda Chaikin is a wonderful author. I've read several of her series and have loved every one! Linda delves into many cultures and time periods that give us a better understanding of what the times may have been like. We visit India during the latter part of the 1700's in the Heart of India series. In The Buccaneers we travel to Jamaica in the 17th Century for more high seas adventure. Last month I read The Midwife of St. Petersburg and was captivated as I journeyed to Czarist Russia, 1914. I'm praying that there will be a continuation to this story. 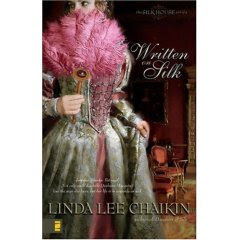 This past week I read Daughters of Silk and Written on Silk. Linda's research must be a passion for her to have so much detail. We meet Rachelle Dushane-Macquinet and her sister Idelette, couturieres, who are under their Grandmere's care as they create gowns for the evil Queen Mother, Catherine de Medici's daughter Marguerite. Rachelle meets the Marquis Fabien de Vendome, who realizes right away she's not like the other women at Court. Together they must try to outwit Madame le Serpent as Catherine is known. She wants power over France through her sons and will do whatever she has to to make this occur. The time period for this historical series is 16th Century, France. Much of this series is taken from historical facts. I went to Wikipedia to learn more about the Catholic persecution of French Huguenots. I believe I looked up Catherine de Medici. After reading through all the information, you can see how accurate Linda's setting is! What an amazing gift to weave historical fact into wonderful fiction. At the beginning of each book, she gives French definitions that she uses throughout the stories. She stays very true to the dialect which isn't distracting at all. For me, the French adds to the story's location and brings me in deeper. I am waiting for the third book Threads of Silk, and I believe it's still being debated whether there will be a fourth. Linda's focus on the Huguenot struggle is applicable to our time period. Much hasn't changed when it comes to the persecuted church. Many people are still dying for their faith. The organization, Voice of the Martyr, exists for a reason. It's good to learn how the Bible became available to everyone, not only for Priests. In other countries now, as in 16th Century France, people could be killed for even possessing a Bible. The next series I will be reading of Linda's is East of the Sun. It looks like I'll be traveling to England and South Africa in the late 19th Century! I already have the 1st book Tomorrow's Treasure. I'm a huge fan of Linda Chaikin as well. I've really enjoyed her newest Silk House series. I also recently read "The Midwife of St. Petersburg" too and praying that there is a sequel because I was not satsified with the ending at all. I've really enjoyed reading your blog on this book. I also would like to recommend reading Linda's Egypt series which is my favourite series by her.